TOTAL FLANKER...a rugby blog: Gloucester Lions? 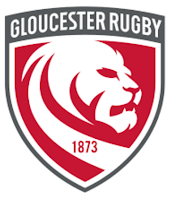 Gloucester's announcement of a new club logo as part of a re-branding exercise strikes me as another example of a marketing agency making money for old rope. Unusually Gloucester have also said that the club will pay for fans who have a tattoo of the old club badge to get the new logo tattooed on their body. Admittedly that's a nice, if a little quirky, touch and there is nothing particularly wrong with the new logo per se. What price, however, on a change of name to Gloucester Lions in the not too distant future?